Enter this key into any cabal client to join the public cabal. Cabal is super young, and while we try to dogfood it as we develop it, sometimes things break. If they do, please join us on freenode.net IRC in #cabal-club and let us know! No servers are needed to join a cabal, or to start your own. Everything is stored and runs locally. A cabal can never go down or be taken away. A cabal is identified by its secret key (cabal://7d99b453506b974...) that you share with your friends. This key lets them find and join the cabal. 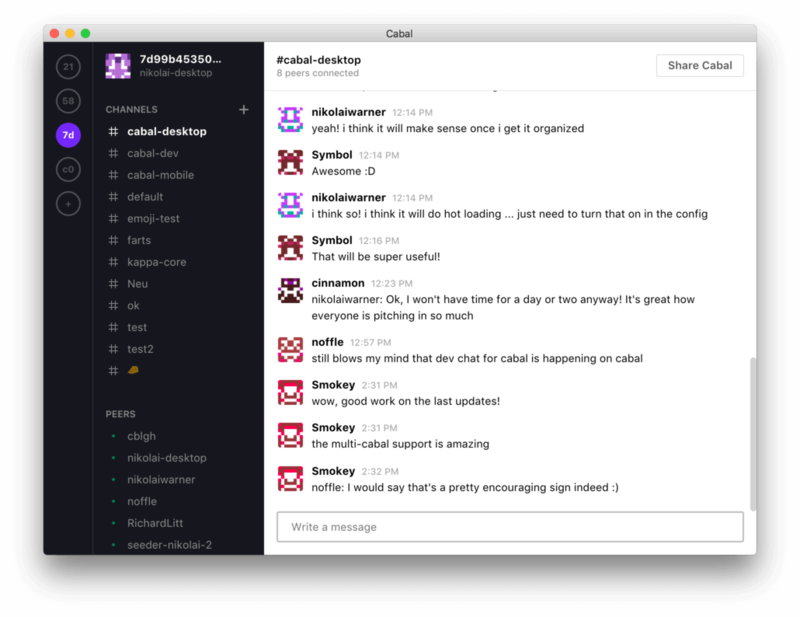 Cabal works over the internet, but also lets you chat over the local network. If offline, you can still browse your full chat history, and send messages that will be sync'd with any future peers you connect to.